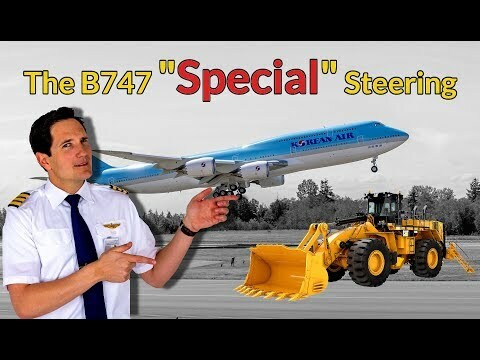 Dear friends and followers welcome back to my channel and to a great video about the BODY GEAR STEERING of the Boeing 747. So as we look at the 747-400 you can see that she is one very long airplane, 70,7 meters in length and 64.9 meters of wingspan, not to mention her younger and even longer sister the 747-8, but I´ll come back to her in a minute. Now the body gear is electrically linked to the nosewheel steering, meaning if either pilot moves the nosewheel tiller, to steer the plane along a taxiway, as soon as the nosewheel is deflected more than 20 degrees, let´s say to the left, the body gear steering comes active and each body gear truck rotates in the opposite direction, as the respective actuator, in this case, the right one, forces the forward part of the truck to the right and aft to the left. And obviously into the other direction placing the tiller to the right. Interesting to know, the system hydraulically centres the body gear and deactivates the system if the ground speed increases beyond 20 knots, and comes active again when the speed decrease through 15 knots. Besides that, the rudder pedals which are also connected to the nosewheel steering, won´t activate the body gear steering at any time, as you can only deflect the nose wheel by 7 degrees to either side not reaching the activation of 20 degrees like the tiller. But so more within the video!